Shirley Williams, the daughter of the writer Vera Brittain, gained a scholarship to read PPE at Somerville in 1948. She played an active part in university life and was the first woman chair of the Oxford University Labour Club. After graduating from Oxford, she won a Fulbright scholarship to Columbia University in New York, later returning to the UK to work as a journalist, and then as General Secretary of the Fabian Society (1960-1964). She married the renowned philosopher, Bernard Williams (marriage dissolved in 1977) and the US political scientist Richard Neustadt in 1987 (he died in 2003). Her political career took off when she was elected Labour MP for the constituency of Hitchin in 1964, and quickly gaining promotion, she rose to become shadow Home Secretary in 1971. When Labour returned to power in 1974 she was promoted to Cabinet, becoming Secretary of State for Education and Science in 1976. She lost her seat in 1979. With the Labour party becoming increasingly left wing, she joined with fellow senior labour MPs Roy Jenkins, David Owen and Bill Rodgers, to form the Social Democratic Party in 1981. In the same year following a by-election, she became the country’s first SDP MP. Following a split in the SDP in 1987, the majority of its members voted in favour of a merger with the Liberals which became the foundation of the modern day Liberal Democrat party. 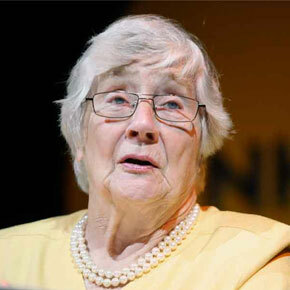 Alongside her political career, Shirley Williams pursued an academic career. In 1987, she became Professor of Elective Politics at Harvard University’s Kennedy School of Government. She also served on the Senior Advisory Committee of Harvard’s Institute of Politics and was involved in the development of emerging democracies in Central and Eastern Europe. In 1993 she took her seat in the House of Lords as Baroness Williams of Crosby. She was leader of the Liberal Democrats in that House from 2001 to 2004. She continues to be actively involved with the party. She was the only British member of the International Commission on Nuclear Non-proliferation and Disarmament (ICNND) and was advisor to PM Gordon Brown on nuclear proliferation from 2007-2010.